As anyone who has visited my blog before will doubtless know, I do a lot of screen recording. No, I mean a real LOT! I record my screen for hours each and every day. I create video based courses covering a range of applications for Mac, iOS and even PC. I also live stream tips, tricks and tutorials using ScreenFlow for local capture. 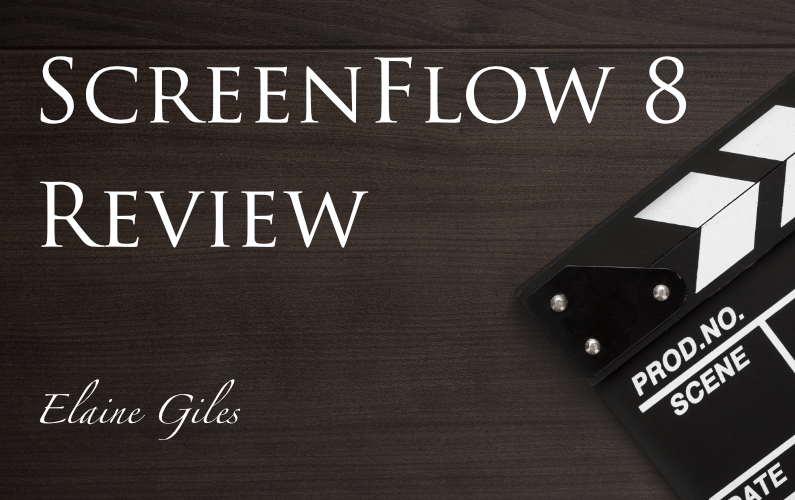 I’ve detailed all the reasons ScreenFlow is my preferred screen capture app before in a previous review so I won’t waste your time with details of my personal preferences … but feel free to check out those details in my ScreenFlow review from June 2016 if you’re curious. Let’s get on to all the new features in this latest release of ScreenFlow, version 8, released on 1 August 2018. I’ll admit to being a little underwhelmed personally with some of the flagship new features added to the last couple of versions of ScreenFlow. Yes, I dutifully upgraded but I felt the new features were less than compelling for a veteran screen caster. For example, the ability to capture only a part of the screen was added in version 6 and I couldn’t have cared less! You can deal with everything in post so why bother recording only a part of the screen and risk missing something that decides to unhelpfully open outside the recording area? And while I welcomed the arrival of a global library in version 7 it wasn’t all I’d hoped it would be. So I approached this new version more than slightly resigned, expecting the “new features” would all be aimed at making the life of less frequent users than myself easier. I am happy, very happy, to report I was pleasantly surprised at the care to detail evidenced in this new version. My number one request since the first version of ScreenFlow appeared has been the addition of templates. If you spend your days making YouTube videos or tutorial videos you’ll soon learn that many elements required for each video are the same. Titles, stingers, lower thirds, overlays, contact details, watermarks and more are all exactly the same in each video. Other elements do change, like the title text of a video, but they still need to match in terms of font and styling. My thinking was that to have the ability to add as many of these elements to the timeline as makes sense prior to recording the main content would be a huge timesaver. I know I can do this in a single file and then make duplicates of that file each and every time I create a new video but it’s not ideal. Finally Telestream have implemented this feature and what’s better is that the implementation is much better than I had ever dared to hope it might be. All the standard elements of a template are there, saving an existing file with a certain range of content in place. What takes ScreenFlow’s implementation of templates beyond the norm is the addition of a completely new concept inside the app: Placeholders. They are added to a standard ScreenFlow file before you save that file as a ScreenFlow template. To use one of the templates you create is simplicity itself. From the New dialog select New From Template, then select the template you want to use, per the screen capture above. Clicking the New button takes you to a screen within the dialog box where you can configure the standard capture options. That’s the basic use of Placeholders but here’s where it gets even better. At the point you’re crafting your template, and adding placeholders to the timeline for the recordings to be slotted into, you can configure all the standard options you have until now had to wait to do until after the recording session. An example will demonstrate the power of this. 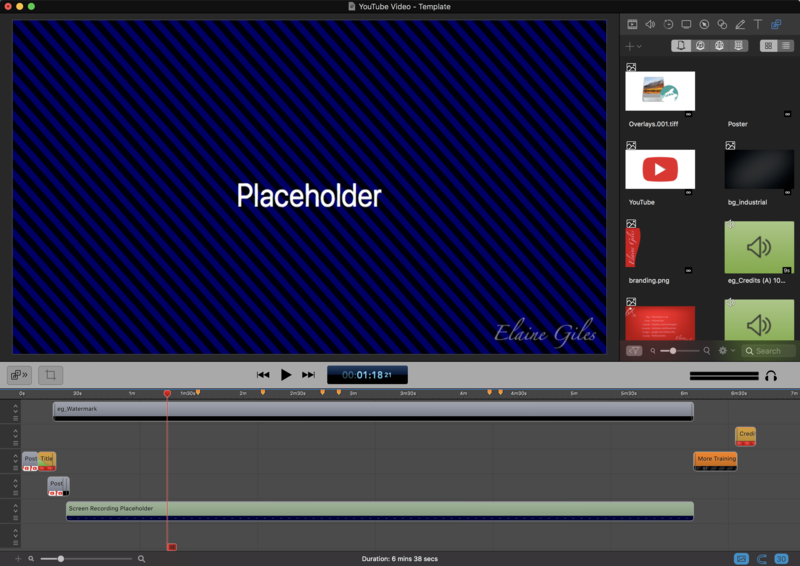 Imagine you have added all your titles, credits, lower thirds and a placeholder for footage captured from your camera. That camera placeholder can be configured in exactly the same way we currently work with captured footage after it’s captured. This means that BEFORE you have captured your camera footage you can have a Chroma Key Video Effect applied to the placeholder. As soon as you press stop on your recording session ScreenFlow will open with all your captures correctly placed and your camera footage chroma keyed for you. I can’t over-emphasize just how much features like this will improve your productivity inside ScreenFlow. In keeping with this improved productivity theme the next new feature is just as much a time-saver as templates and placeholders. A style is a saved, named, set of options that can be collectively applied to other objects with a single click. So whatever your preferences are for video, audio, motion effects, screen recordings, callouts, touch callouts, annotations or text you can apply them to any number of elements with a single click. Together with templates this is a feature I’ll be making extensive use of with my video courses where consistency of look is critical for polished output. While ScreenFlow 8 itself is a single purchase with no continuing subscription element. Telestream has embraced a subscription model for an optional extra to ScreenFlow in the form of a Stock Media Library. It’s a great addition and the convenience of accessing virtually anything you need from within your editor with no additional cost beyond the $/£60 annual subscription makes it a compelling proposition. The library contains in excess of 500,000 items of high quality video, audio and still images. Access to these assets is via a dedicated panel in the media inspector. The collection can be searched, sorted and filtered from the same location. The assets are downloaded on demand and added to both the timeline and the project library. These stock assets can also be added to the Global Library, thus making them available locally to future projects. ScreenFlow has long had the ability to display a single thumbnail representing the content of a clip on the timeline. This upgrade adds the ability to display track thumbnails. Track thumbnails are displayed along the entire length of the clip and represents the contents of the clip at each stage of the clip. The display of this track thumbnail is optional as is the display of the single traditional thumbnail. The easiest way to access the view options for the timeline are via the icon below the timeline. The addition of these extra frame rates shows how ScreenFlow has developed beyond its original purpose of producing screencasts to being more of a general purpose video editor . Until this version ScreenFlow has had a single window interface. Sure, you could open two separate files in two separate windows but there was no way to detach the editing tools from the preview. 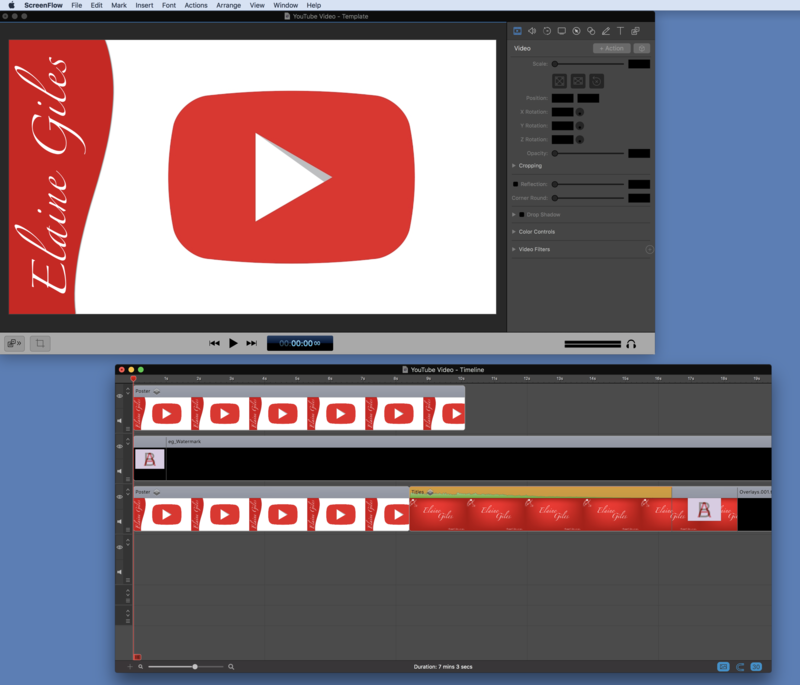 ScreenFlow 8 adds the ability to split the timeline off from the main window. The Window > Detached Timeline option places the timeline into its own floating window completely separate from the video canvas. Initially I wasn’t convinced this option was necessary in my workflow but opening one of my more complex edits, with a huge number of tracks and overlaying content, I was sold. Now, if only I could expand the side panels on to my third monitor and I’d have a full editing suite at my disposal. There are two new audio features. Quick Narration allows a voice-over to be recorded in the post-production stage directly from the editor. 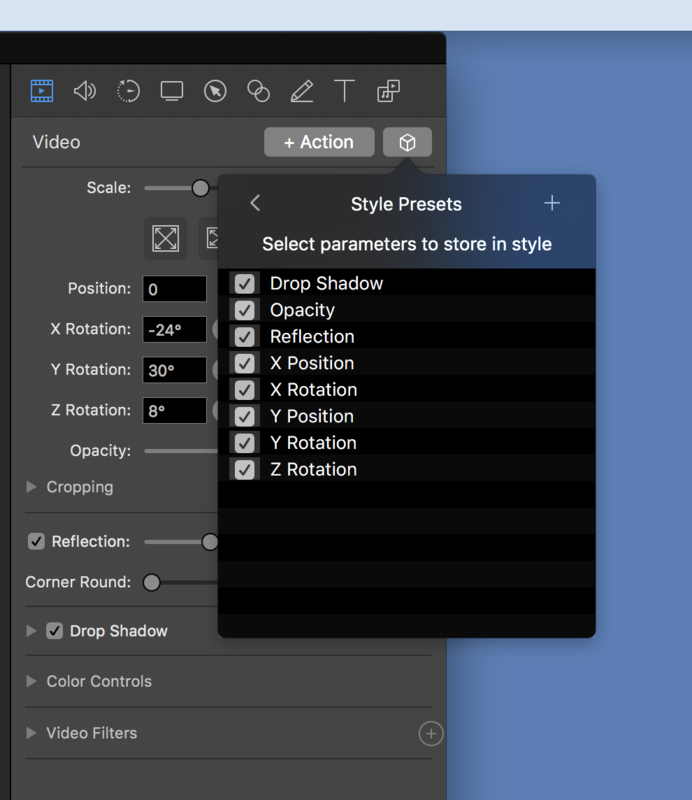 Selecting Insert > Narration from the menu changes the ScreenFlow interface replacing the standard transport controls with a recording function. 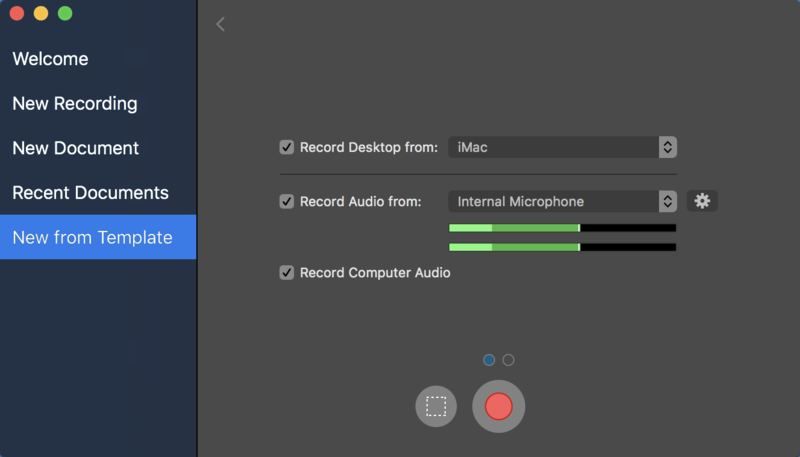 Pressing the red record button starts the narration recording and this will stop either automatically after the time specified previously or manually using the stop button that replaces the record button once recording starts. Once the narration recording is stopped the user is given an option to either keep the narration or discard it. Electing to keep it returns you to the timeline with the newly recorded narration placed ready for working with. Electing to discard it returns you to the narration recorder ready to try again. Getting the best out of this feature requires that your editing location would work as well as a recording location but for quick fixes or additions it’s a welcome feature. The second new audio option is Insert Speech Clip. This displays a dialog box containing a large text box into which you type text to be converted to audio using the Mac’s inbuilt speech options. Think Siri reading text to you! The dialog box allows different voices to be used for this synthesised text but there is no option to rehearse each voice to find one most suited to the job at hand and when the dialog box closes the text is removed. If you need to audition voices be sure to copy the text from the dialog before trying the first voice. 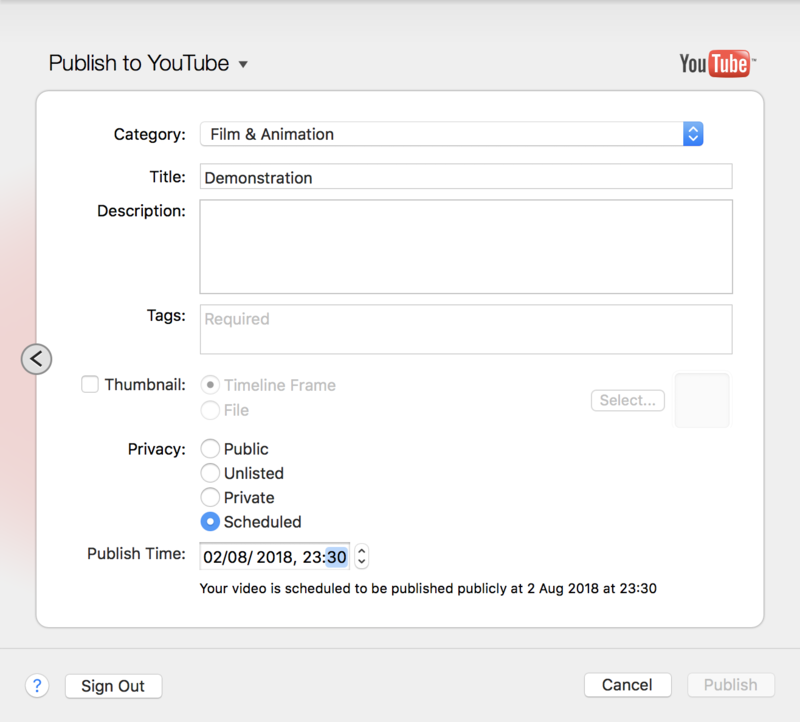 In addition to the more common options to have your video uploaded directly to YouTube as Public, Unlisted or Private there is now an additional option of Scheduled. Scheduled allows a date and time to be specified for the video to be made publicly available via the YouTube platform. Once you’ve placed a tick in the box to tell ScreenFlow to add a thumbnail the default option is to select a frame from the timeline by clicking the select button and scrubbing through your video to locate a suitable frame. The second option is to click File and select an existing image file from your Mac. 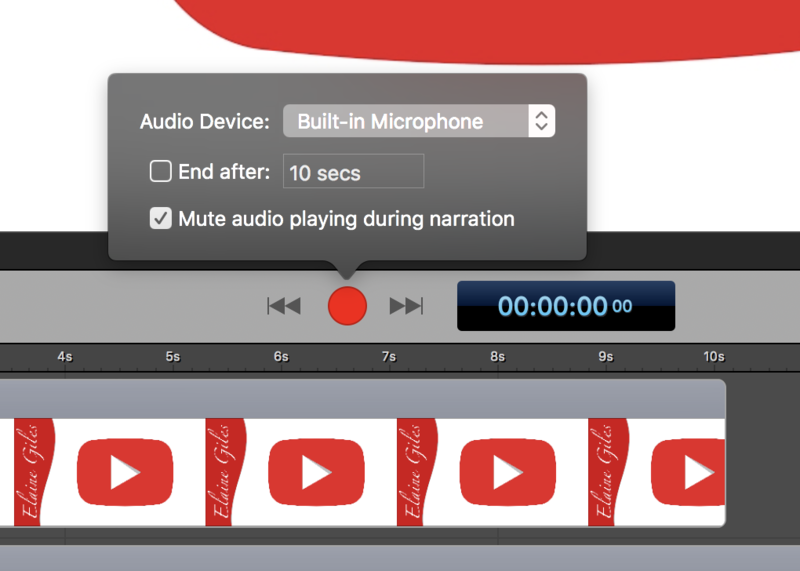 Another great time saving feature when publishing out your finished video. Telestream must be reading my mind! In the last few weeks I have been creating a more than usual amount of animated content on my video timelines and I was surprised to discover the ability to automatically align and distribute objects wasn’t already available inside ScreenFlow. The Arrange menu option addresses that oversight. The Arrange is also now home to the Group/Ungroup commands and the clip locking toggle. This is another feature that those spending the most time inside ScreenFlow will greatly appreciate. Anything that enhances a workflow is greatly appreciated. The perfect example of the attention to detail evidenced in this version of ScreenFlow is the long overdue addition of an indication which screen is being recording at the point of selecting a screen. ScreenFlow 8 displays a red frame bordering the screen selected in the screen drop down of the record dialog. I’ll admit this is certainly not essential if you have a single screen or even possibly if you have two screens. This is because they’ll doubtless have different names and you’ll instantly know which you have selected. However, for those of us with three screens where the external two screens are the same make and model I can assure you it’s been a nightmare since version 1 of ScreenFlow to know which screen you’ve selected. This is partially down to Apple’s idiocy. First, in the System Preferences where there is no way to name a monitor. Secondly, when a Mac is rebooted the unhelpful (1) and (2) added to the names of the external monitors, in an attempt to distinguish them, are assigned randomly. So yesterday the monitor on the left was number 1 but today it’s number 2. Doubtless tomorrow it will develop another identity crisis! The difference now is I won’t care as much because ScreenFlow has my back. When I select a monitor I can’t miss the red frame and I’ll know instantly which screen is the subject of the recording. 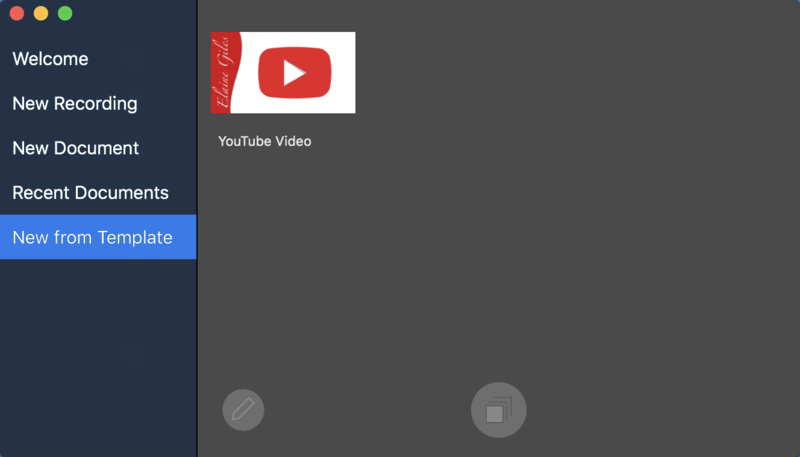 ScreenFlow is available both directly from Telestream and via the Mac App Store. The price of a new license is $129 and an upgrade from versions 4,5,6 or 7 is $39, if purchased directly from Telestream. The Mac App Store price is $129.99/£129.99 and there is no upgrade pricing available, in line with Apple’s policy precluding upgrade pricing. You do have an option to upgrade from a Mac App Store license to a direct license for version 8 via the Telestream website though. Should you buy direct from Telestream or via the Mac App Store? In terms of functionality of ScreenFlow it doesn’t matter how you make your purchase. In terms of how quickly you have access to incremental point updates and how you upgrade in the future it very much does. Direct purchases qualify for upgrade pricing. Mac App Store purchases do not. It is for this reason that Telestream usually reduce the price of ScreenFlow for a day or two on the Mac App Store when they release a new version. Very recent purchasers can upgrade free of charge if they purchased directly too. The very nature of the Mac App Store review process means that direct purchasers have access to updates faster than those buying via the Store. That might be an important consideration for you if you encounter a show stopping bug in the current version. The features added will improve the workflow of existing users and new users alike. Those same improvements will also benefit both casual and pro users. Time saved in editing is always welcome and this version of ScreenFlow contains myriad features that will help all levels of user get their videos to viewers faster than ever before. Upgrade with confidence today, you won’t regret it.